Order swatches before you buy! Polyester based dobby weave crepe, popular for blouse manufacturing. 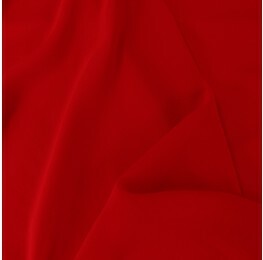 An elegant polyester based dobby weave crepe, that is very popular when it comes to blouse manufacturing. Lightweight enough, this garment drapes beautifully with a soft hand feel. All orders are subject to product availability. If an item is not in stock at the time you place an order, we will notify you and refund you the total amount of your order, using the original method of payment. Delivery times are to be used as a guide only and are subject to the acceptance and approval of your order. All orders must be signed for by yourself or a neighbour. Unless there are exceptional circumstances, we make every effort to fulfil your order within the next working day of the date of your order. If an occasion occurs where we are unable to deliver your item on time, we will be in contact to notify you and inform you when your item will be delivered at earliest time of convenience. Shipping costs are based on the weights of your order and the delivery method. To find out how much your order will cost, simply add the items you would like to purchase to your cart and proceed to the checkout page. Once at the checkout page, shipping charges will be displayed. Additional shipping charges may apply to remote areas or for large or heavy items. You will be advised of any charges on the checkout page. Sales tax is charged according to the province or territory to which the item is shipped. If there is any damaging to the packaging on delivery, contact us immediately at fabricroom@gnktrading.co.uk. You have 14 calendar days to return an item from the date the ordered product was received. To be eligible for a return, the item must be unused and in the same condition that you received it. The item must be in the original packaging. Your items need to have a filled out order summary form provided with your delivery when returning an item. If you require another order summary form, please email fabricroom@gnktrading.co.uk with your order number. If you are unsure of the order number, please log in to your account for further details. We do not allow returns on lengths larger than 9 meters. We do not allow exchanges unless the item you purchased is defective. If you have received a defective item, please contact us at fabricroom@gnktrading.co.uk with details of the product and the defect. Once we’ve received your item, we will inspect it and notify you that we have received your returned item. We will immediately notify you on the status of your refund after inspecting the item and whether or not you are eligible for a refund. If your refund is approved, we will initiate a refund to your credit card (or original method of payment). You will receive the credit within a certain amount of days, depending on your card issuer’s policies. If you have any questions about delivery and shipment on your order, please contact us at fabricroom@gnktrading.co.uk.